And a great display it was! Good to see the people of Sweden enjoy the art of bonsai. I too, along with my wife and other members of the Sutton Bonsai Club, plus a splinter group, were also at a display and workshop last week end @ Wisley gardens in Surrey. We had a large marquee to ourselves. A workshop was held on the Friday, where 10 + members of the public, who had previously booked a slot with the RHS to attend, drew lots to select their tree from a collection of larches. They were first given a talk by Andy on the raw basics of bonsai design and then let loose, with the assistance of club members, on choosing the tree’s shape and eventual design. Each student was shown how to wire their tree and encouraged to carry on and finish the whole wiring. I truly believe that everyone of those students had a great day and walked away with their own special little treasure. 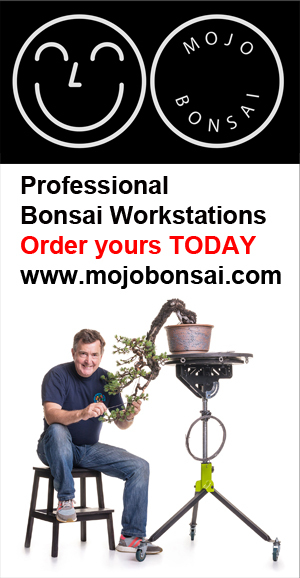 Hopefully they had also caught the bonsai bug. On Saturday and Sunday it was solely for displaying our own trees. Some of which, in my opinion, would have won major distinctions at any bonsai shows. An outstanding acer palmatum x appeared to be most viewers choice, along with a root over rock cotoneaster. We were blessed with good weather, which brought out thousand’s of the general public, many of which passed through our tent.